After putting up Christmas decorations this year, Damien Morris had some extra batteries left over and did what many people do -- tossed them in a drawer for future use. The loose batteries sparked a fire that could have destroyed his Charlottetown, P.E.I., home. Morris said he had no idea batteries could pose such a danger, and he is sharing his story to warn others -- with experts saying such fires are more common than most Canadians realize. Health Canada says it received more than 100 consumer reports over the last year involving batteries -- everything from overheating to starting fires. "Any type of battery could potentially be a problem," said Andrew Hulan, a product safety officer with Health Canada. "The type of battery, when it does fail, that we tend to see more issues with is lithium-ion batteries. It just happens to be that the material with which a lithium-ion battery is constructed is reactive to the air. If that battery is breached, it fails in almost an explosive manner," he said. 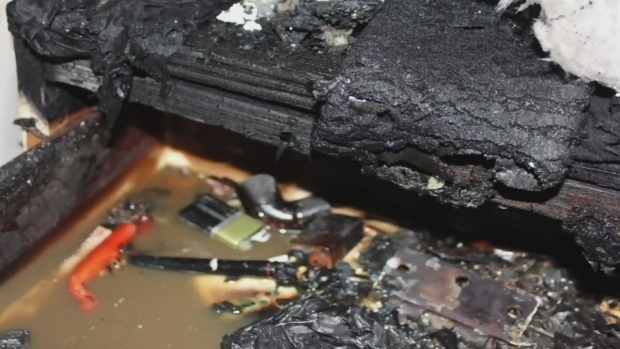 In July, the Newfoundland and Labrador Association of Fire Services issued warnings after two fires were blamed on lithium-ion batteries. One of the fires, that left a brother and sister homeless in St. John's, was blamed on batteries in a radio-controlled toy car. Luckily, Morris' Nov. 18 fire scare in Charlottetown wasn't as tragic. "At 2:30 in the morning we heard our smoke detectors going off. I got up and got the kids. My wife got up and said 'I smell something weird'," Morris said. They went downstairs to discover the main floor of the home full of smoke, with the worst of the smoke in the kitchen, where it was billowing from a kitchen drawer. "I opened the drawer and it all went in flames. I shut it quick. I grabbed the drawer and got my wife to open the patio door and I threw it outside," Morris said. "The fire damage wasn't so bad. It was mostly smoke damage." Morris said emergency crews arrived and the fire marshal determined that the 'C' and 'D' size batteries he had stored in the drawer had started the fire. "The two male ends of the batteries connected, creating heat energy and caught the combustible dish towels on fire," he said. Raynald Marchand, general manager of the Canada Safety Council, warns problems can often occur when charging batteries near fabric and other combustibles. "It's important that when you recharge the rechargeable batteries that you do it in a safe area so that they don't overheat, and preferably recharge them when you're home," he said. "Computers which have large batteries are often recharged while on a couch or on a bed and they can produce quite a bit of heat while they are being recharged." He said lithium-ion batteries are of particular concern because they pack a lot of power and the contacts or terminals are often along one side. "If you take a battery for a laptop or camera, all the terminals are on one side, so if those terminals are set against, say, a wet towel, or something else it is more problematic," Marchand said. Hulan said the main cause of problems is people not following the instructions that come with the batteries, particularly when it comes to charging them. "Batteries are designed to be charged at a specific current and voltage. If you use a charger that is not rated to your battery then you increase the likelihood of overheating and damage to that battery," Hulan said. Both Marchand and Hulan say batteries need to be stored properly in their original container, or other non-conductive packaging to prevent them from being shorted. And they say spent batteries should be taken to a proper recycling centre and never tossed in the garbage or in a fire. Hulan also warns against improper storage of the small, "button" style batteries common in watches, greeting cards, and some toys and LED lights. He said Health Canada has investigated a number of cases where young children have gotten the small batteries and swallowed them. "That battery can actually burn through their oesophagus, their windpipe or stomach, and that leads to very serious and potentially fatal injuries," he said. 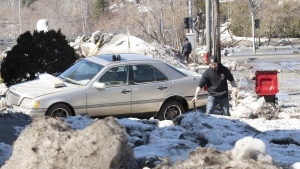 Hulan said anyone experiencing a battery issue they believe poses a hazard should report it to Health Canada. Morris said he's just glad he was home when the fire started -- or their house could have been destroyed. He says with the holiday season upon us, and an increase in battery use, he hopes more people heed the warnings about battery safety. When your phone battery dies, are public charging stations safe to use?